The annual hackathon Code:XtremeApps: (CXA) concluded on July 28 this year with the prize presentation ceremony awarding the best solutions to address several real-world challenge statements posed. More than 300 participants took part in this year’s event with 35, 22 and 61 teams in the Junior, School and Open categories respectively. 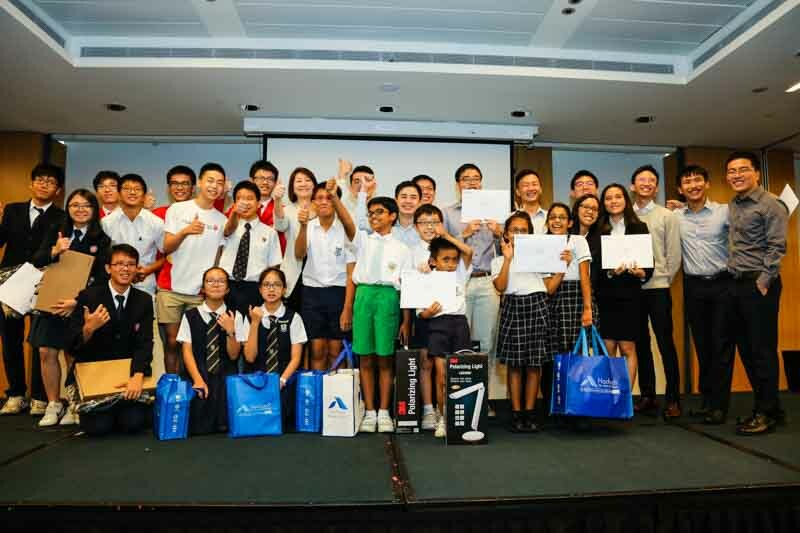 Neptune, the winning team from the Open category, walked away with cash prizes worth a total of $9,000, while Hacker Republic and Pro Hackers, the top winning teams for the School and Junior categories respectively, walked away with attractive gadget prizes. For the Open category, the winning solution of Neptune which consists of Jay Lim Jiayi, Wang Yaofeng and Oh Yong Liang from PSA Corporation aimed to help improve the overall safety of port operations. This was done through the use of on-board accelerometers, GPS and other sensor data together with Complex Event Processing capabilities in streaming analytics to provide real-time feedback for immediate reinforcement of good driving behaviour within the port premises. In addition, statistical analysis was used to provide post-shift feedback for targeted training and long-term improvement. Hacker Republic and their team members, Doreen Ting Luo Qi, Jerrayl Ng and Liu Chen-En of Dunman High School took top honours for the School category with their Horus Event Tracker, an application that allows administrators and space owners to monitor the crowd engagement of ad-hoc events and space owners. The application consists of 3 modules: The sensor-enabled Arduino connected to a Raspberry Pi (the Raspberry Pi is a series of small single-board computers developed in the United Kingdom by the Raspberry Pi Foundation to promote the teaching of basic computer science in schools), a Raspberry Pi camera as well as social media analytics. The sensors connected to the Arduino help monitor a specific exhibit or small area – the sound level of the area, number of people passing by and the number of wireless and bluetooth connections in the area is used to measure its ‘Buzz’. The Raspberry Pi camera uses the openFrameworks (an open source C++ toolkit) library and Footfall motion tracking application to count the number of people in the given area. It also monitors traffic, using these metrics to calculate the number of people in the area over time. The last module scoops data from social media and uses the TheySay sentiment analysis API (TheySay uses advanced data analytics to analyse opinions, moods and feelings from material available on the web) to determine user responses to the exhibit. Pro Hackers (above photo), which consists of Puneeth Choudhary Kollu, Dylan Leong and Noor Iman Ahmad Fairuz of Ulu Pandan Stars, emerged victorious in the Junior category with their Smart Bus Stop solution. A humidity sensor is used to detect rain and moisture, which prompts the roof of the bus stop/shelter to expand to provide more cover for other waiting commuters. Fans were also included in the Smart Bus Stop solution model, which would be activated if the weather gets too hot. There is also a built-in buzzer which help inform commuters if their bus is approaching. On top of the top three prizes for each category, two special prizes were awarded this year – firstly, the Best & Innovative by Design Award awarded by PSA to the team from the Open Category that demonstrated the most innovative design solution in tackling PSA’s challenge sentiment. This award was won by XCVI, a mixed team from NUS/NTU (National University of Singapore/ Nanyang Technological University) consisting of Denise Tan, Sherina Toh Shi Pei and Jarrett Yeo Shan Wei. XCVI created a mobile app called iOffice@PSA to aid the implementation of a smart office in PSA’s future office. The other special prize is the Security by Design prize awarded by the Cyber Security Agency (CSA) of Singapore, which was awarded to the team that best demonstrates their approach and implementation of ‘Security by Design’, or how it incorporated security considerations upfront in the design of their project. This award was won by InsertTeamName from Singapore University of Technology and Design (SUTD) with team members Yin Ji Sheng, Yim Tat Yuen Bernard and Nicholas Yeow Teng Mun. Their solution, the Project HomeDesk, aims to make everyone’s work environment more personalised and make employees feel more at home to help increase their productivity. CXA, Singapore’s longest 24-hour hackathon is into its 11th year and the theme for this year is My Smart City: Connecting Our Senses. CXA continued its strong history of ensuring participating teams were well-prepared with multiple workshops and site visits organised prior to the competition day to give participants the basics of not just IoT technologies, but also on standards, data analytics, business intelligence, and the personal data protection act (PDPA). Organised by the Infocomm Media Development Authority of Singapore (IMDA) and IT Standards Committee (ITSC), and supported by CSA, Home-Fix D.I.Y., PSA Singapore and Suntec City, the CXA hackathon aims to raise the awareness of coding, computational thinking and problem solving, and to get more people of all ages interested. The hackathon also aims to encourage the use of standards when deriving standards.